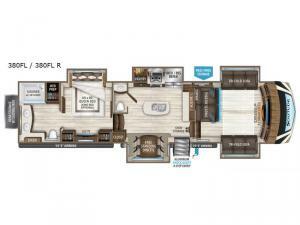 If you have been wanting to make the move to full-time RVing, imagine enough walking around space with five slide outs, extra sleeping accommodations for the grandkids in the front separate living area, and plenty of storage for all your things. You will find a dream kitchen for the cook in the family, plus the free standing dinette offers a cozy place to eat meals. The walk-through bedroom features two space savings sliding doors, and the rear master bathroom offers dual sinks, one for you and one for your spouse. You might even decide to add a few options such as a washer and dryer and/or a king size bed. Outside, there is a pass-through compartment, and rear storage with a sliding tray making getting to your gear easy. Take a look, you will be happy you did!